Yuri was super knowledgeable and professional. He explained the processes and offered good information regarding my furnace and how to keep it functioning well. 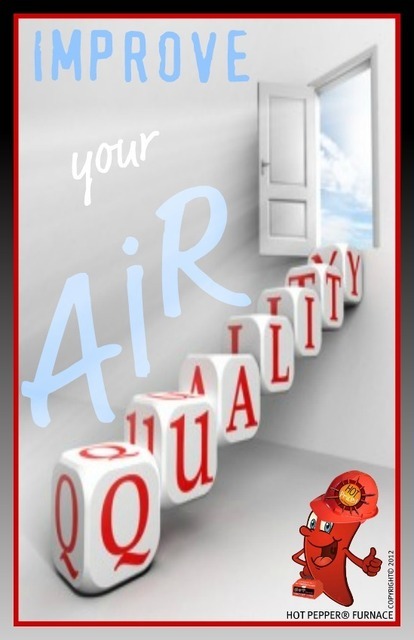 Furnace, ducts, air conditioner,humidifier, air cleaners, fire place,cleaned and sanitized. The technician was very friendly and efficient. He arrived on time and put down runners to protect my new flooring. He took the time to show me how to do maintenance in between cleaning. The whole experience with Hot Pepper was fantastic, from the booking with Cliff to Yuri coming and cleaning the system. Cliff was very clear during the booking process about how much it would cost and how everything would be done. When our temperatures took a really cold dip he was quick to make arrangements for a better day to come out. Yuri is awesome - he is a friendly and extremely thorough worker. Our house has been renovated and he literally pulled pounds of construction waste out of our ducts. He explained everything and showed us the “crap” he was pulling out. He cleaned our furnace and checked it and explained the things we should watch for in the future. No hidden costs, excellent workmanship and really good guys run this business. I would easily recommend them to friends and family let alone anyone reading this review! I spent a week researching different companies to clean my ducts. This company was fantastic, highly recommend them. No extra hidden environmental fees or that unreasonable 45$ service charge for having a high efficiency furnace other companies charge. I had called in a week prior to find out what services were available and when I called in again Cliff remembered who I was. He was very accommodating and made the booking process super easy. In contrast i had to wait over 12 hours to hear back from other service companies and some just emailed me back with no personality what so ever. When the cleaner showed up he was very professional and friendly. Yuri did a great job of cleaning my ducts and went above and beyond to show me how to install and clean my humidifier. Turns out i was using the wrong filter and instead of pushing me to buy his products showed me where to get a replacement for cheap and what to look for to make sure it was the right one this time around. Additionally, I got to try out their POWER SANITIZER BENEFECT product which at first I thought would be just a lot of hype. But actually it now feels a lot better in the house and I will be asking for that again in the future. We’d just had our furnace and hot water tank replaced along with replacing all of our windows and doors so we were in need of a good duct cleaning. We contacted Hot Pepper through their website ( after finding them here on Homestars ) late Saturday afternoon and received a call from Cliff first thing Monday morning. Cliff was great to deal with, he let me know that it was their busy season and that they were booked solid for the next two weeks. I told him I was home during the day so if there was a cancellation in our area we’d be open to doing it sooner. ( had been living in organized chaos for the last six weeks !) I booked in with Cliff and on Wednesday morning I heard from Cliff regarding a cancellation...they could come that afternoon ! Youri arrived on time and was great to deal with. He explained everything that would happen and got right to work. I would highly recommend Hot Pepper and book them again. Thanks Cliff and Youri for the great service ! Youri was very knowledgeable and shared his tips to help us get the most efficiency out our heating and A/C units. Even when I booked Cliff took extra time to explain the work and the what if’s. All the help was greatly appreciated. Definitely customer focused!! 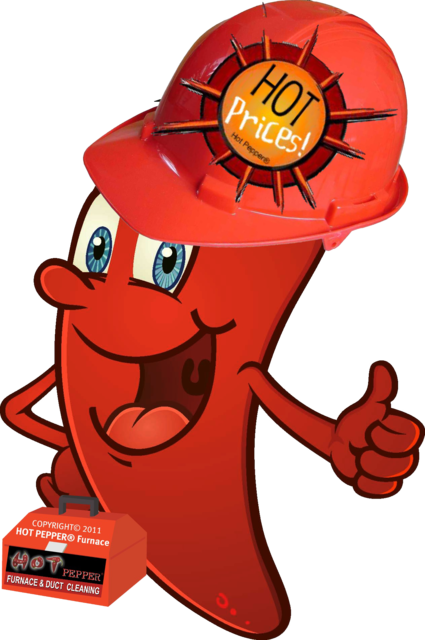 HOT PEPPER was recommended to us by Willams Home Comfort who was installing our new furnace and AC (great job). I was very happy with HP's service (can't recall the price but it was totally reasonable, didn't even get other quotes). When the furnace install got pushed up they were happy to reschedule to make our adjusted timelines. Would use them again! 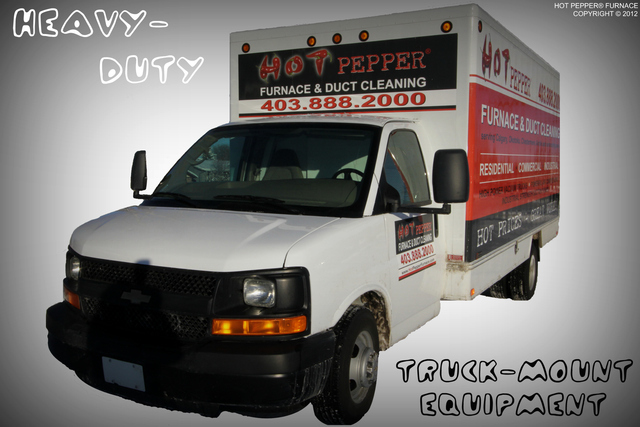 I want to thank Hot Pepper Furnace and Duct Cleaning for their exceptional service. Specifically I want commend Uri for doing a great job of cleaning my furnaces, duct and fireplaces, but more importantly for his work ethic in chasing down an intermittent sound when he restarted the main furnace. That intermittent noise was the reason for my call to Hot Pepper. What Uri found was a wedge of 2 x 4” that had somehow fallen into the furnaces heat exchanger. The wood shows signs of small flames and some notable charring. My home smells cleaner, there’s no noise coming from my furnace and I slept with peace of mind. We truly value our client reviews of our services and therefore work hard to achieve nothing but POSITIVE feedback for the work performed. 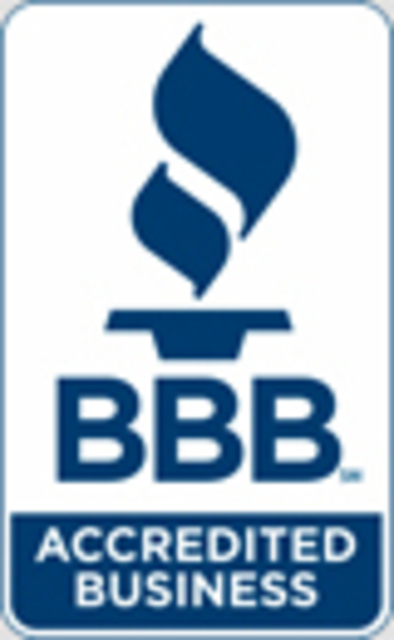 We are BBB accredited and have excellent ratings! All of our Trucks are equiped with new professional truck-mount equipment that produces industrial strength suction power which helps to improve indoor air quality by removing many harmful air pollutants. 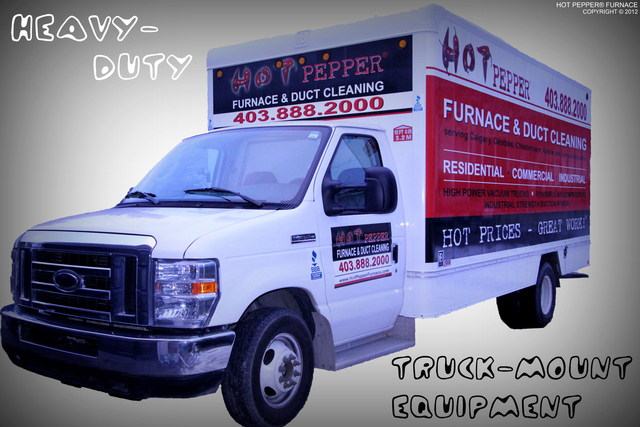 Furnace and Duct Cleaning, Dryer vent cleaning, Vacuflo cleaning and much more. Please enquire for more information. City of Calgary Business Licence, City of Airdrie and Town of Cochrane Business Licences.